For the last couple of years we at 13 Pastures have had the opportunity to work with many patients suffering from a variety of ailments. We have been fortunate enough to work with autistic kids, veterans suffering from PTSD, seniors suffering from chronic pain and arthritis, and the list goes on. But by far, the patients we saw, and continue to see the most are those with mild to moderate pain, possible early stages of arthritis and those with mild to moderate anxiety. Some, but not all are on prescribed meds to manage their ailments and looking to CBD to take over and get them off their prescribed medications once and for all. On the surface these cases might seem easier to treat than say someone with autistic tendencies or endometriosis, but for us it’s the opposite. The mild to moderate pain and anxiety patients are the most difficult to find consistent and significant relief from CBD. It’s not that CBD doesn’t provide relief in these types of cases, it does. But finding the correct dosage and product type can be challenging. You see there’s more to taking CBD than simply taking the suggested daily dose on the package. For some, to get the most out of CBD requires some patience, experimentation, trial and error, and in some cases, even lifestyle changes. For example, if a patient is in pain due to inflammation and eating foods that cause more inflammation, than there’s only so much that CBD is going to be able to do. About a month ago a lady came to see us. She was a bit overweight and walked on a cane due to pains from a motorcycle accident years before. She was a borderline diabetic who also had extreme anxiety from all medical issues she was dealing with. In addition, she took seven different medications to manage the conditions. And while I empathized with her situation, I quickly learned that she wasn’t doing anything to help herself. Her diet was garbage, she ignored her doctors recommendation to start exercising and said she usually sat around her home sad and depressed and was looking to CBD to fix everything! Even though CBD is working miracles in many peoples lives, it is not a miracle drug. CBD is, and should be taken, as a supplement to healthy lifestyle choices. For this reason, I decided to start a blog focused on diet, exercise and how CBD and other cannabinoids play a role in both. My goal is to educate, inspire and hopefully make it an easier for those who had enough of living unhealthily transition to a healthier lifestyle. Extreme fitness and dieting have been a huge part of my life for over 25 years and feel I have a lot to share. I’m will be discussing dieting tips (some pretty extreme ones) and recipes with CBD, intermittent and prolonged fasting benefits, exercise and a slew of other related topics, including CBD. The lifestyle choices we make are critical to our body’s health and ability to maximize absorption of nutrients, including CBD, as well as, the ability to heal itself. Health.gov put out a strong article on the link between Nutrition and Health and how chronic level diseases such as diabetes, cancer, and even bone health have risen because of poor eating habits and lack of exercise! Whether it’s pain, a chemical imbalance, tumors, or whatever, the body has the ability to fix what’s wrong, but it’s up to use to give it the tools to allow it to do its job. That means hitting the problem from 3 angles: a daily cannabinoid regimen, a proper diet, and exercise program. With this golden trifecta in place, I am certain that you will find significant improvement in all areas of your life! The perfect addition to a healthier lifestyle is CBD! It’s important to remember that CBD does not treat symptoms; it seeks to create homeostasis within our cells. CBD and the other cannabinoids work with our body’s CB receptors to fix the problem causing the pain, not the pain itself, and this can take time. How much time? It’s impossible to say. Even studies cannot accurately predict this because other factors come into play, like how serious is the problem, the patients diet, exercise habits, do they drink or smoke? Are they overweight? All of these have a direct impact on our daily pain and anxiety levels. Because unhealthy habits will always be fighting against CBD’s healing properties, users should go into their CBD treatment with the expectation of daily CBD dosing for 3-6 months in combination with a healthy diet, exercise. As you begin making healthier choices, you might find that CBD is helping more than you know. Adopting change in any capacity can sometimes be met with challenges and resistance, especially positive lifestyle changes. There will always be times of struggle, frustration, and stress in our lives and instead of turning to the comforts of food, turn to CBD. With its anti-anxiety and healing properties, CBD is the perfect choice to help you along and no guilt from binge eating! Moreover, CBD isn’t normally associated with weight loss, but it absolutely has an impact on both metabolism and fat loss. CBD works with our endocannabinoid system (ECS) to help regulate the metabolism and works to effect ‘fat browning.’ In an upcoming article I will give more details on the effects CBD has on the metabolism and three ways it helps to effect fat browning. When buying CBD products, I recommend staying away from edibles that contain sugar. Remember, sugar spikes insulin, which is never what you want. The goal should always be to keep insulin levels low. So instead, stick with full spectrum CBD oil made using MCT, Coconut, or Grape seed oil or a CBD isolate. Be careful not to take to much CBD. While users will not get high from taking CBD, it is biphasic more is not better. According to ProjectCBD.org, “CBD and THC have biphasic properties, meaning that low and high doses can produce opposite effects. An excessive amount of CBD could be less effective therapeutically than a moderate dose. So start with a low dose and slowly increase the dosage over time. If you’re new to CBD and want more information on dosing, I highly recommend visiting ProjectCBD.org. The link will be direct you to their CBD educational page that has great information on getting started with CBD. There you will learn far more than I can explain in this post. Many, if not all of the ailments we experience are a direct result of inflammation. Web MD defines inflammation as “a process by which the body’s white blood cells and substances they produce protect us from infection with foreign organisms, such as bacteria and viruses.” On the surface this sounds like a good thing, and it is, for the short term. Inflammation is how the body heals itself, but too much inflammation can lead to all sorts of problems. Inflammation is linked to arthritis pain, (link to arthritis.org) anxiety and depression, and a host of other ailments, including insulin resistance. Chronic inflammation can lead to heart disease, and even cancer! In an article on Everydayhealth.com, they state” underlying inflammation may be a common denominator with other medical problems that often accompanies RA (Rheumatoid Arthritis). In the article they link to a study published in the January 2016 issue of Arthritis Research & Therapy, that states 41% of the patients studied developed at least one co-existing medical condition, most commonly hypertension, cancer, stroke, heart attack or osteoporosis within 5 years after being diagnosed with RA. Compare this to chart 2-1on Health.gov that breaks down the good and bad food intake in relation to the recommended allowance. It clearly shows the majority of American’s diet revolves around high inflammation foods! It’s important to note, I am not suggesting that the government daily diet should be followed to the letter. In fact, I absolutely believe some of their recommendations should be updated. For example, more and more studies are now showing that higher fat based diets with limited to no grains or sugar is best. However, their point about what and how much we consume is reliable. Obesity is a problem and has a huge effect on inflammation and pain levels. Just search obesity and inflammation in Google and almost 7 million results will come up. On the first page alone, there are four studies from the National Library of Medicine, as well as Harvard and other reputable sources that all detail the link between obesity and inflammation. Moreover, fat puts excess weight on joints, bones, and organs creating even more pain and discomfort. With all this inflammation, a sedentary lifestyle and bad eating habits how can anyone expect CBD, or anything else for that matter, to treat what’s wrong? For all you know CBD is working, but the excess sugar and unhealthy fats are working that much harder? 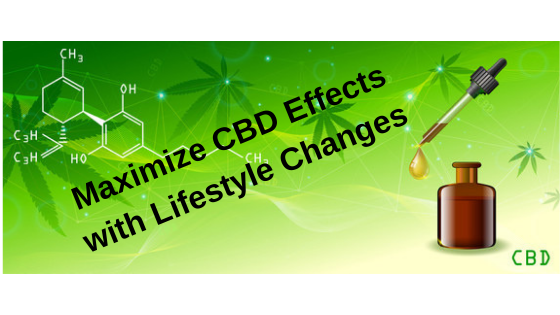 The fact of the matter is this; if you are suffering from pain, anxiety, irritable bowel syndrome, croons, cancer and pretty much everything else out there, the first step needs to be a diet and lifestyle change coupled with a low dose CBD regimen.. I’m 100% confident that if you adopt these changes you will feel better! In the next article we will be discussing intermittent fasting and the role CBD plays.